(Newser) – In what appears to be the biggest strike in West Virginia history, thousands of teachers walked off the job Thursday, closing schools in all of the state's 55 counties, the Wall Street Journal reports. The central issue is teacher pay. The starting salary for a teacher in West Virginia is around $32,500; the average teacher salary is $44,701. According to the AP, that's the 48th lowest in the US. Dale Lee, president of the West Virginia Education Association, says teachers haven't gotten a raise since 2014. 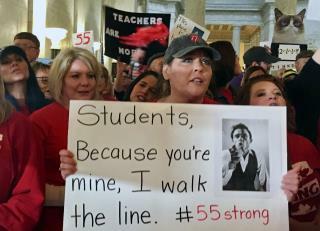 Teachers on Thursday marched on the state capitol chanting "You work for us!" and bearing signs with slogans like "No recess until YOU clean up this mess," CNN reports. The two-day work stoppage was scheduled to continue on Friday. "The most important thing for us right now is public education and that we're standing up for our students and our colleagues," says Christine Campbell, president of the American Federation of Teachers-West Virginia. Gov. Jim Justice signed a bill Wednesday night that gives teachers a 2% pay increase in July and a 1% raise each of the next two years. "We certainly recognize our teachers are underpaid," Justice says. But teachers say the pay increase is too little and does nothing to address other concerns, such as rising healthcare costs. Earlier this month Justice said it would be a "crying shame" if teachers went on strike, and the state's attorney general called the strike illegal. Teachers' unions have worked with food pantries to make sure kids have enough food during the work stoppage, and churches and community centers are hosting programs for kids so parents can still go to work. A+ for Johnny Cash and Grumpy cat. We get what we pay for. What kind of education do you think our students get if we pay teachers - who need to have extra certification on top of a BA degree - 40K a year? For goodness sake, at least give them a real cost-of-living adjustment - 1% is below inflation. Countries with the best educational outcome have very different systems, but the one thing they have in common is that they pay teachers well and teaching is considered a prestigious profession. In exchange, teaching is selective and is a difficult job to get - thus only the best candidates end up teaching. Many of the people in college who barely graduated and were far from bright went into teaching. The good graduates did not consider teaching because of the low pay v. the difficulty of the job. In places like South Korea or Finland with the best school you can't even apply to be a teacher unless you are in the top third of graduates. Oh, disappointed Canadian. For a moment I thought the news was Teachers Walk Out to Encourage (some kind of ) Ban on Guns as that seems to be the issue of the day. If that happened across the nation, maybe things would change a little more quickly. I suggest making licenses or bullets cost $500 each (wouldn't that keep the NRA happy?) but that will never happen.